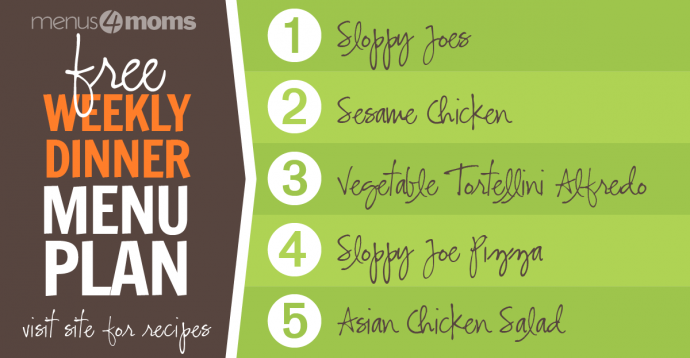 Save the leftovers from tonight’s Sloppy Joes to use as the base for Sloppy Joe Pizza on Day 4. If you need to, double the recipe. Although it is easy to buy Sloppy Joe sauce in a can, this homemade version is tastier and easy to make. Brown the ground beef with the onion and green pepper until cooked through. Add garlic powder, mustard, ketchup, brown sugar, and pepper; stir and simmer for 10 minutes. Serve on hamburger buns. 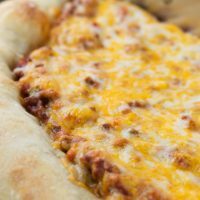 If you are implementing planned leftovers, try using the leftovers on Sloppy Joe Pizza. 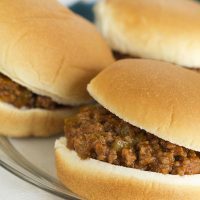 Using bulk cooked ground beef from the freezer makes prep for these Sloppy Joes even quicker. The Sesame Chicken recipe makes 4 pounds of chicken, which should be plenty to have chicken for dinner tonight and have leftovers for Asian Chicken Salad on Day 5. Place chicken in large bowl. Mix remaining ingredients together in a small bowl. Reserve ½ cup marinade for basting. Pour remaining marinade into bowl with chicken. Cover and marinate several hours or overnight in refrigerator. Remove chicken from bowl; discard marinade. 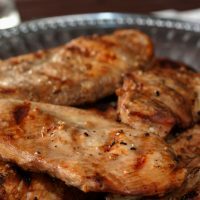 Grill chicken over medium heat, about 25-30 minutes or until juices run clear, turning frequently and basting with reserved marinade. This recipe makes enough to save half of the cooked chicken for another meal (if using it this week, refrigerate; if not, freeze). If you don’t want to grill the chicken, it can be baked at 350°F until it reaches an internal temperature of 165°F. You can buy pre-toasted sesame seeds at Asian markets or you can lightly toast your own. 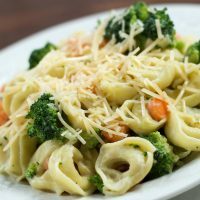 You can use a jar of prepared Alfredo sauce to save time, or prepare a quick homemade Alfredo sauce with just butter, cream, Parmesan cheese, salt, and pepper. If fresh vegetables are in season, this is a good way to use them – just steam and add to the pasta instead of frozen vegetables. Prepare tortellini according to package directions. While pasta cooks heat Alfredo sauce and gently fold in vegetables. When heated through, add sauce and vegetable mixture to tortellini and garnish with Parmesan cheese. Use the leftover Sloppy Joe meat sauce from Day 1 to prepare the pizza. This is a planned leftover meal that uses leftover prepared Sloppy Joe meat sauce. Preheat oven to 425°F. In a large skillet, combine Sloppy Joe meat from Monday with corn and green onions. Heat through. Spread heated mixture on top of a baked pizza crust; sprinkle with cheese. Bake for 12 to 15 minutes or until cheese is melted. Use the leftover Sesame Chicken from Day 2 in Asian Chicken Salad. 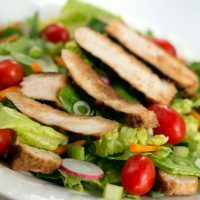 If you have extra chicken after preparing the salads, chop and freeze it to make prep easier later when a recipe calls for cooked chicken. This is a perfect recipe for planned leftovers which reduce prep time and cut waste. The homemade dressing is full of rich flavors, but a prepared Asian dressing could be used to save even more time. In a small bowl, combine all dressing ingredients and whisk together thoroughly. Cover and heat in microwave for about 30 seconds to ensure that honey is dissolved. Shake well before serving. In a large bowl, combine salad greens, celery, carrots, onions, tomatoes, and Mandarin oranges; toss well. Layer sliced, cooked chicken over salad. Sprinkle with sesame seeds. Serve with Homemade Asian Salad Dressing. Garnish with sliced almonds if desired. Store leftover salad dressing covered in the refrigerator.